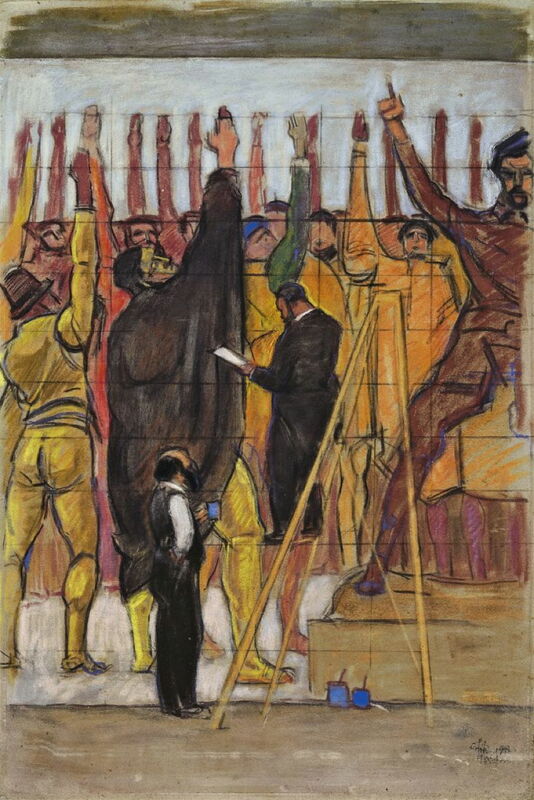 Emil Orlík (1870–1932), Ferdinand Hodler Working on the Hanover Mural (1913), pastel on paper, 74.6 x 49.7 cm, location not known. Wikimedia Commons. Ferdinand Hodler was a member of artistic circles which extended well beyond Switzerland, to Vienna and Germany in particular. Among his most important associates were Gustav Klimt, Emil Orlík, Albin Egger-Lienz, and Koloman Moser. I will look at Egger-Lienz another time, and at Kolo Moser later this year when I commemorate the centenary of his death. This article looks briefly at Emil Orlík (1870–1932). Orlík was born and brought up in Prague. He moved to Munich to attend the private art school run there by Heinrich Knirrs, then gained a place at the Munich Academy of Fine Art. It is sometimes claimed that he trained alongside Paul Klee, but Klee was nine years younger than Orlík and their training didn’t even overlap. During his training, Orlík became interested in print-making, and learned engraving too. Early in his career, he worked for the German art magazine Jugend which was famous for its Art Nouveau style. He then took most of 1898 away from Munich, travelling to the Netherlands, Britain, France, and Belgium. On his return, he joined the Vienna Secession, and worked on its publication Ver Sacrum. Emil Orlík (1870–1932), Rest in the Mountains (1900), print, further details not know. Image by ArishG, via Wikimedia Commons. Orlík had become particularly interested in Japanese art, and decided to go to Japan to learn woodcut techniques there. He left Munich in the Spring of 1900, and returned a year later. 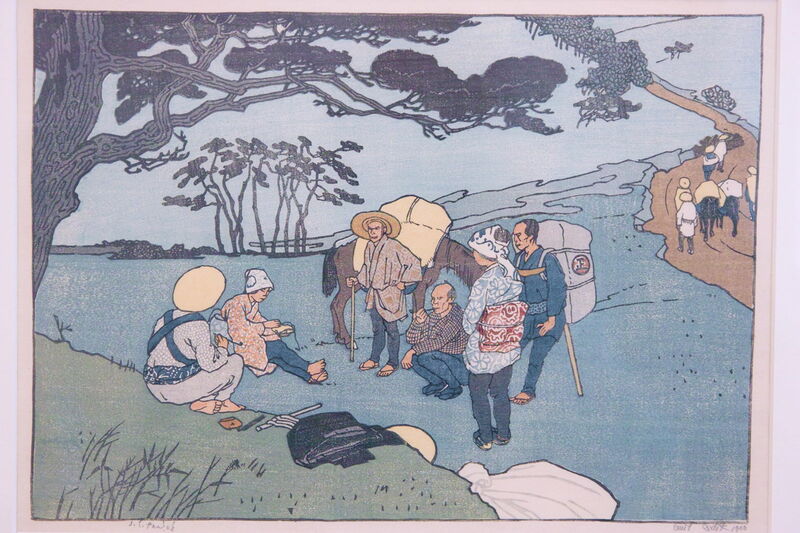 Rest in the Mountains (1900) is one of the prints which he made in Japan, showing his progress in mastering techniques. Soon after Orlík’s return, he and Hodler became friends through their mutual involvement with the Vienna Secession. Emil Orlík (1870–1932), Model (1904), oil on canvas, 195 × 92 cm, Národní galerie v Praze, Prague, The Czech Republic. Image by Ophelia2, via Wikimedia Commons. In 1904, Orlík painted this unusual Model, in which his model appears to have become shy or distressed. The model’s gown, screen, floor and hanging masks are evidence of the artist’s Japonisme. The following year, Orlík moved to Berlin, where he was appointed to the School for Graphic and Book Art, and taught at the College of Arts and Crafts. Emil Orlík (1870–1932), Castle in Front of Hilly Landscape (c 1905), oil on canvas, 72 x 58 cm, location not known. Wikimedia Commons. Orlík mainly painted portraits and landscapes. 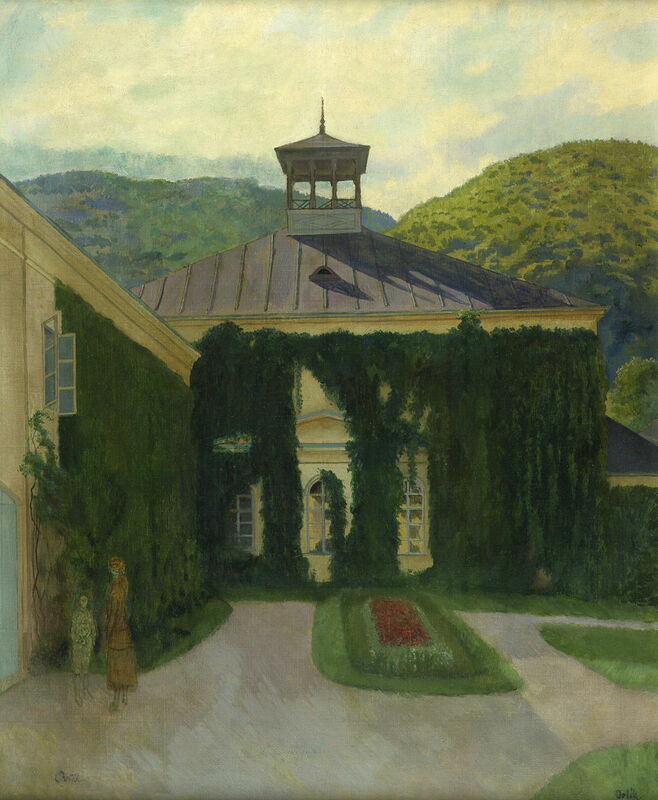 The latter, like this Castle in Front of Hilly Landscape from about 1905, remain quite traditional and realist, and show none of the style or features which were manifest in either Klimt’s or Hodler’s landscapes of this time. 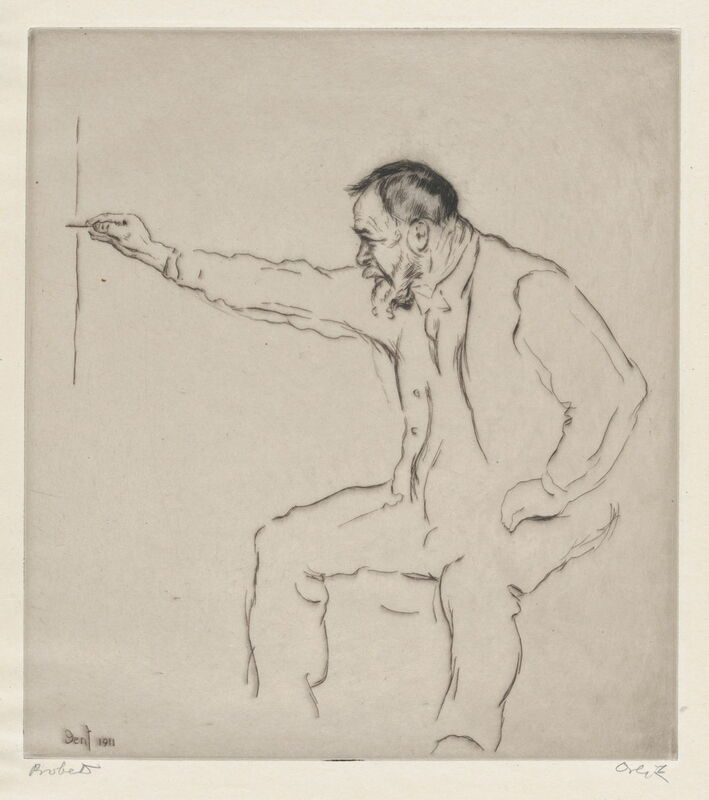 Emil Orlík (1870–1932), Ferdinand Hodler at the Easel (1911), drypoint proof, 25.7 x 16.2 cm, Metropolitan Museum of Art, New York, NY. Wikimedia Commons. In 1911, Hodler was working on a large commissioned mural for the new Town Hall in Hanover, Germany. Orlík stayed with Hodler in Geneva for four weeks as he worked on that and other pieces, and made a series of paintings, drawings and photographs of Hodler at work. At least one of those Orlík turned into this drypoint print of Ferdinand Hodler at the Easel (1911). In 1912, Orlík returned to East Asia, where he visited China and Korea as well as Japan. Emil Orlík (1870–1932), A Chinese Woman (1912), oil on cardboard, dimensions and location not known. Image by Ablakok, via Wikimedia Commons. 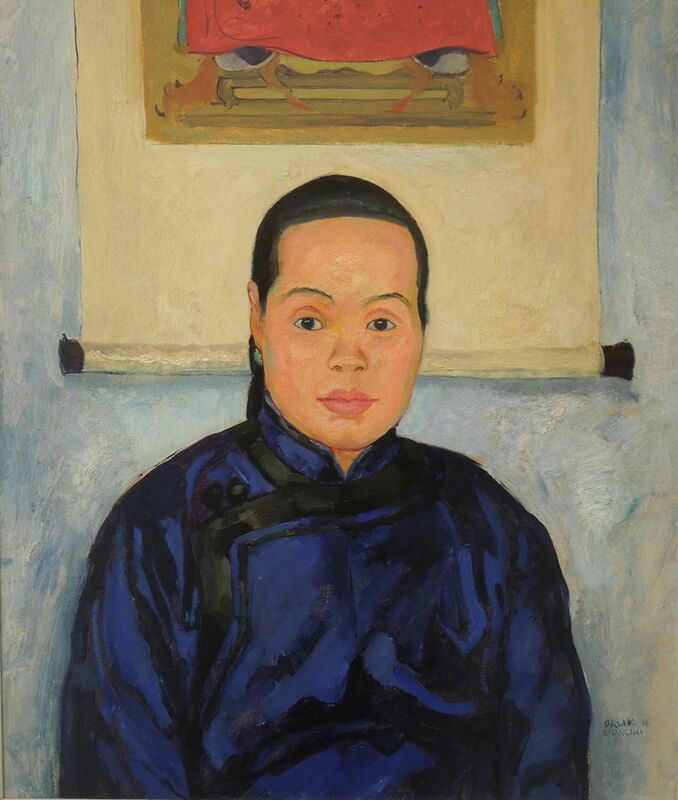 I suspect that Orlík’s portrait of A Chinese Woman from 1912 was painted during that visit. Emil Orlík (1870–1932), Corner in my Atelier (c 1912), oil on canvas, dimensions and location not known. Image by Ablakok, via Wikimedia Commons. 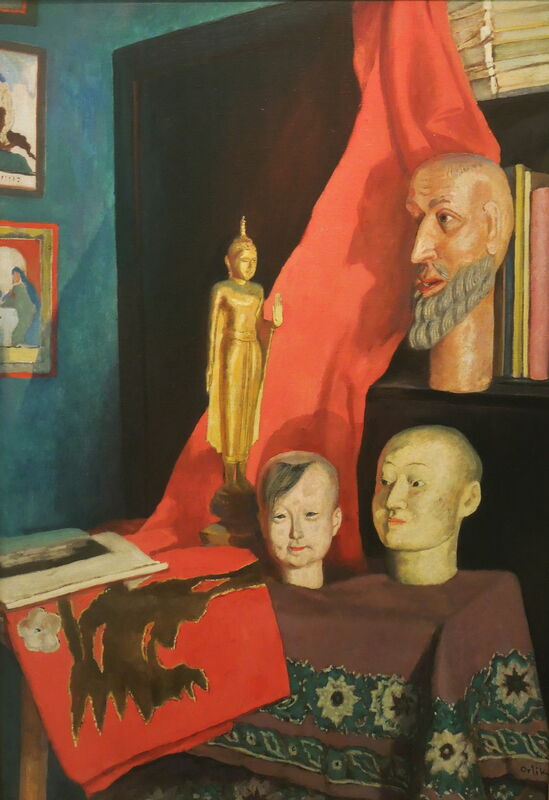 Corner in my Atelier from about 1912 provides further insight into Orlík’s fascination with East Asia. Orlík and Hodler did not meet again until Hodler visited Berlin and Hanover in 1913, to progress work on the large mural in the latter city. Once again, Orlík was ready to capture the Master at work, in his pastel of Ferdinand Hodler Working on the Hanover Mural (1913). Shortly after that, Hodler completed the mural, which was then visited formally by the Emperor Wilhelm II, who is reported to have remained completely silent. 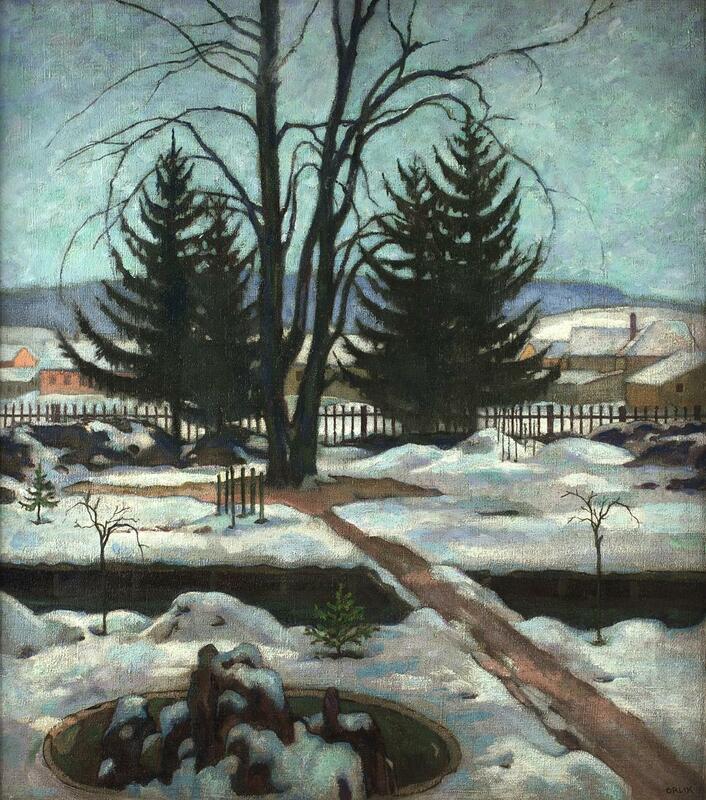 Emil Orlík (1870–1932), Winter (1914), oil on canvas, 90 × 80 cm, Österreichische Galerie Belvedere, Vienna, Austria. Wikimedia Commons. Orlík once reassured a friend that, in spite of his exposure to Hodler’s work, he didn’t start “hodlering”. Although true, his landscape of Winter from 1914 shows compositional influence, with the rhythm of its trees, and subtle symmetry. Emil Orlík (1870–1932), Sunrise from Wendelstein (1917), oil on canvas, 110 x 180 cm, location not known. Wikimedia Commons. 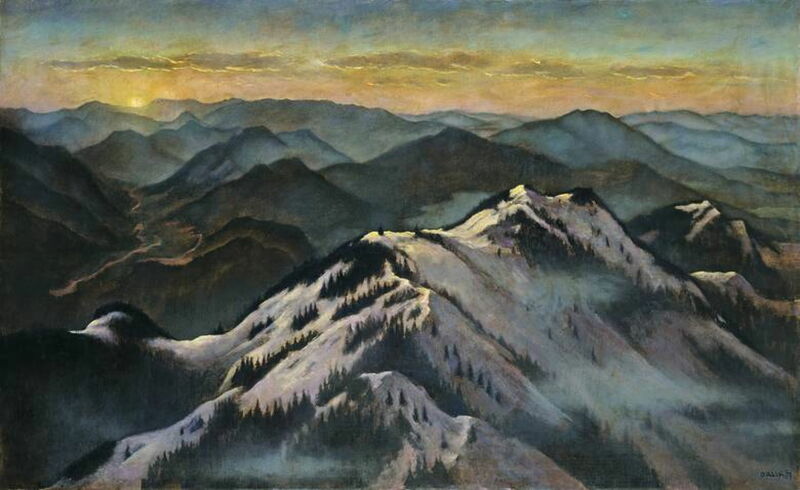 Orlík was also inspired to paint in the mountains, as is demonstrated by one of his finest surviving landscapes, of Sunrise from Wendelstein (1917). The Wendelstein is in the eastern part of the Bavarian Alps, and this view looks towards the south-east from its peak. Orlík did not have to climb the Wendelstein, as a rack railway to its summit had been opened five years earlier. Emil Orlík (1870–1932), Portrait of Albert Einstein (1923), print, further details not known. Wikimedia Commons. Orlík was well-known for his portraits of eminent people in the arts, which include Lovis Corinth, Max Slevogt, Max Klinger, Koloman Moser, Gustav Mahler, Richard Strauss, and Thomas Mann. 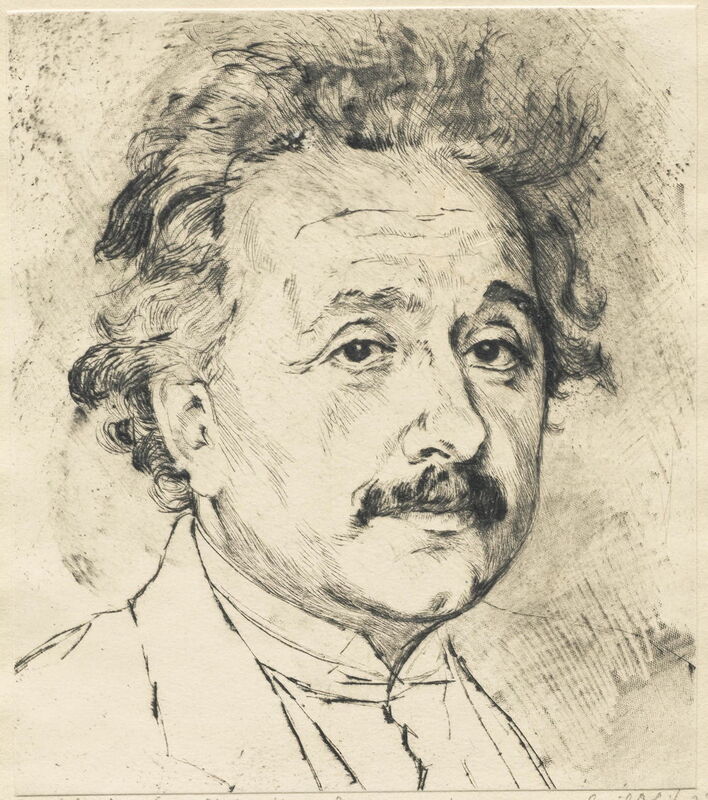 His print of the Portrait of Albert Einstein made in 1923 is another important work. Emil Orlík (1870–1932), Central Park, the Lake in Winter (c 1923–24), etching, drypoint, and roulette, 32.1 x 42.5 cm, Metropolitan Museum of Art, New York, NY. Wikimedia Commons. 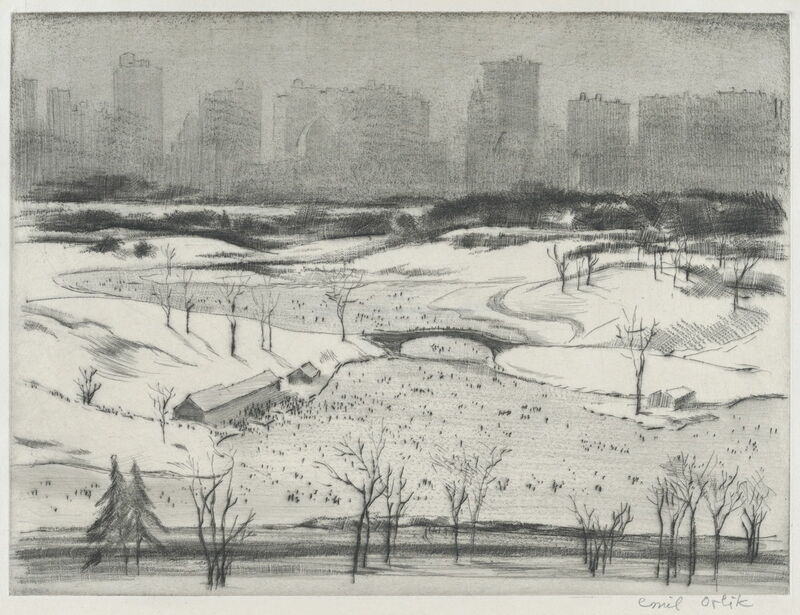 During the winter of 1923-24, Orlík appears to have visited North America, where he made this etching with drypoint and roulette of Central Park, the Lake in Winter (c 1923–24). Orlík died in 1932 in Berlin. Posted in General, Life, Painting and tagged Einstein, Hodler, japonisme, Klee, Klimt, Orlík, painting, prints. Bookmark the permalink.